I’VE LONG been in search of the perfect macaroni and cheese. 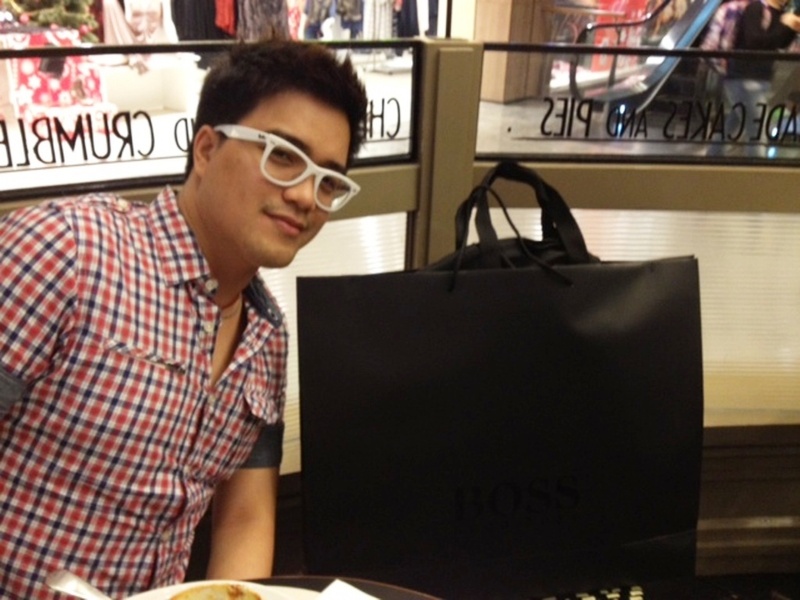 Here in Singapore. With all due respect to that familiar blue box that I’ve loved for the longest time, sometimes, what I long for is macaroni and cheese made the old-fashioned way. I’m taking about starting with a roux of butter and flour, cooked just enough so that the flour is toasty before whole milk – that has first been simmered to the point that a skin has formed on top – is added. A few minutes over low fire and the sauce will have thickened, at which point it can be seasoned with a pinch of cayenne pepper and a few scrapes of nutmeg on a microplane. It will be taken off of the fire before at least two cheeses will be added. I’m thinking Gruyère and cheddar. Then, to this sauce will be added perfectly cooked penne, and in the context of the macaroni and cheese on my mind, “perfectly” means a couple of minutes under what the package instructions tell you. Everything will be mixed well so that the sauce coats every single piece of pasta. This is now ready to be tipped over on to a large baking dish, and then topped with more cheese. Into the oven it will go where the inside will get even creamier, as the top gets to a golden brown color. The sauce and the cheese will bubble over. And that’s when it is ready to make it to the table. That’s when it is ready to be devoured by me. And that was exactly the image in my head as I waited there, at a corner table at PS. 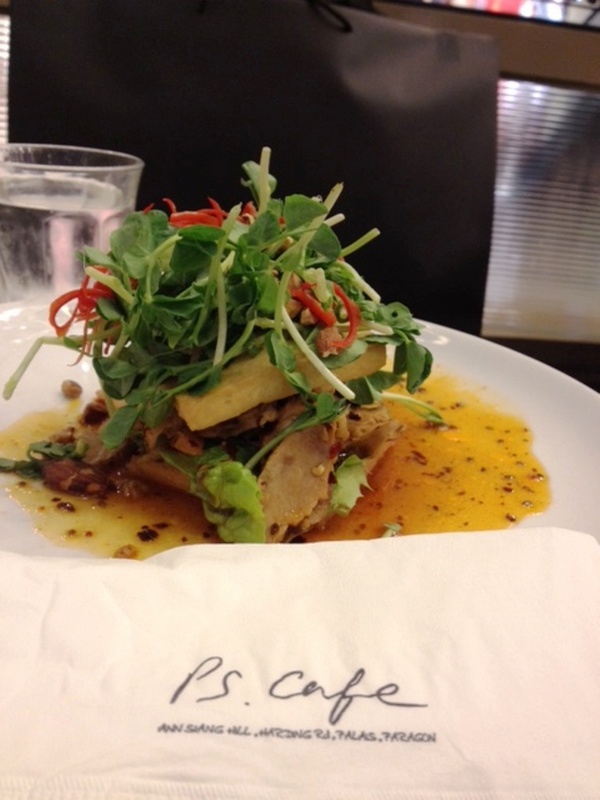 Café at Paragon Mall on Orchard. And how was PS. 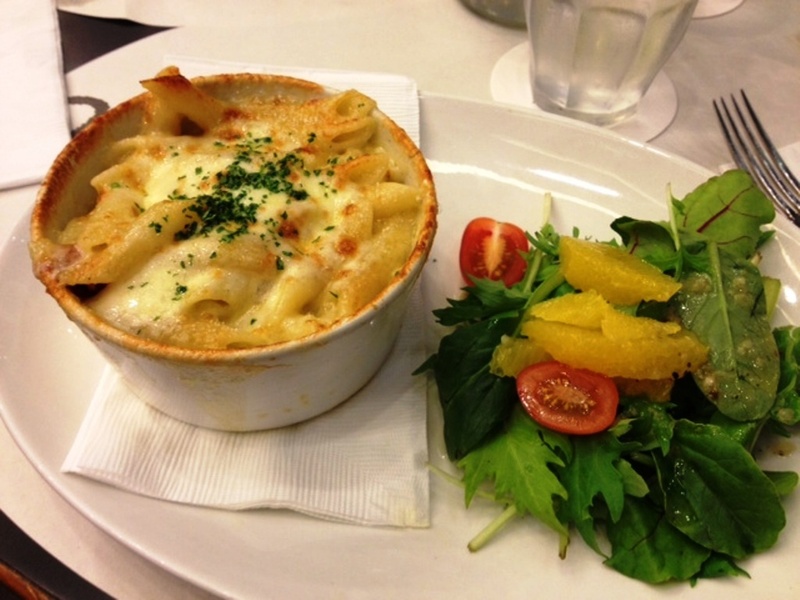 Café’s “Three Cheese Penne”? I sum it all up with, P.S. … I love you. 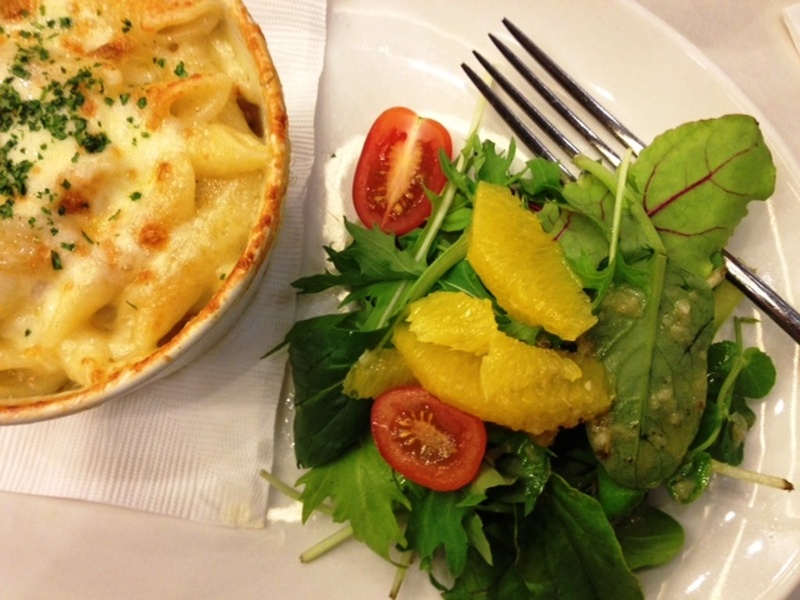 The macaroni and cheese is served with a side salad of baby greens, highlighted with sections of a Valencia orange. 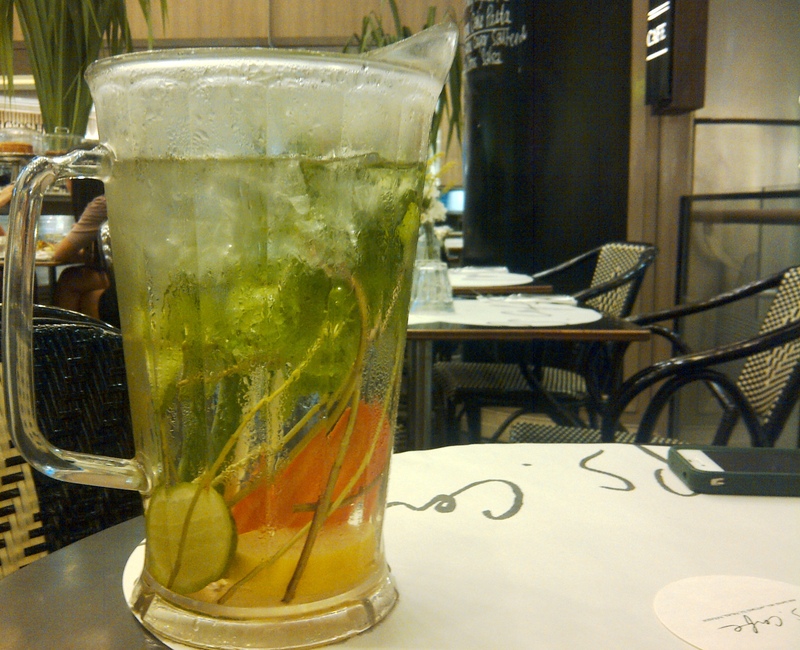 I washed everything down with a tall glass of Iced Moroccan Mint Tea. 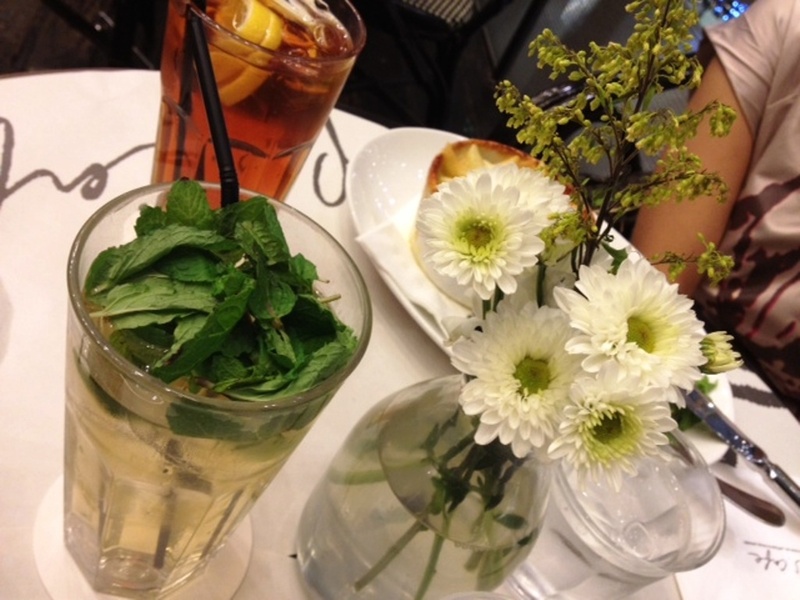 Apart from the iced Moroccan mint tea, I enjoyed the restaurant's water. 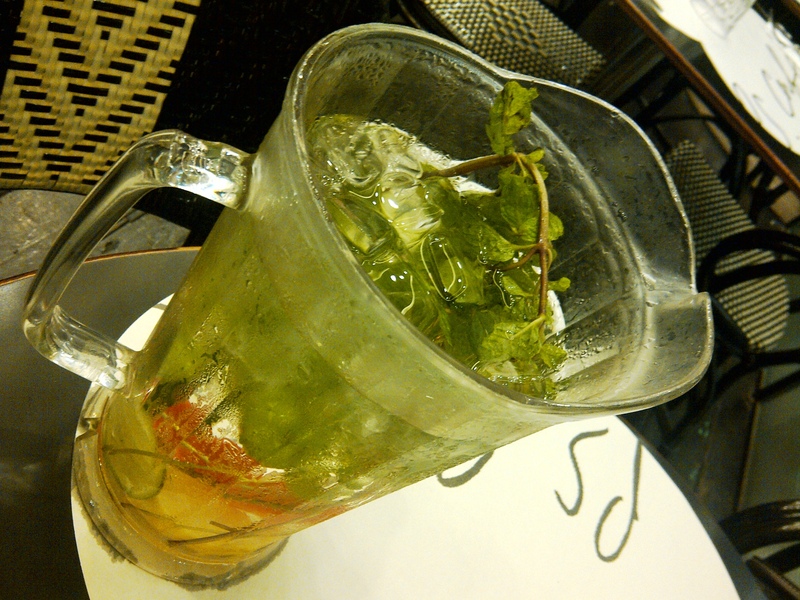 It is "spiked" with slices of cucumber, lemon, carrot, and sprigs of mint. Everything in this water is meant to "cool" it down. 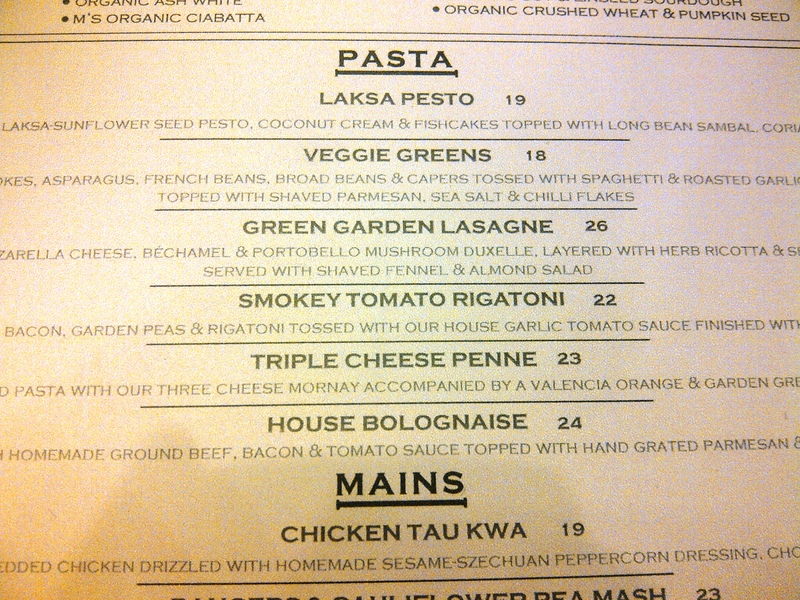 I saw "Triple Cheese Penne" on the menu and didn't have to read any further! PS. 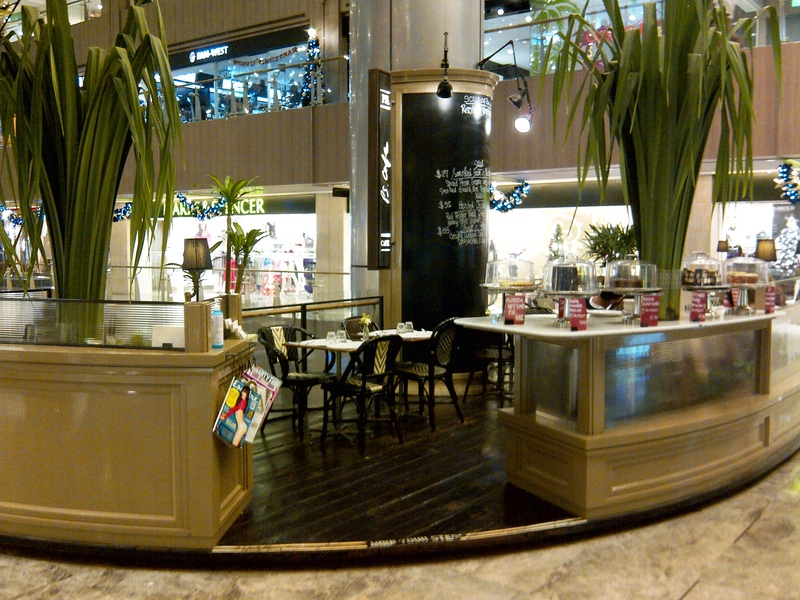 Café at Paragon has both an indoor dining section and this kiosk that overlooks the heart of the mall. 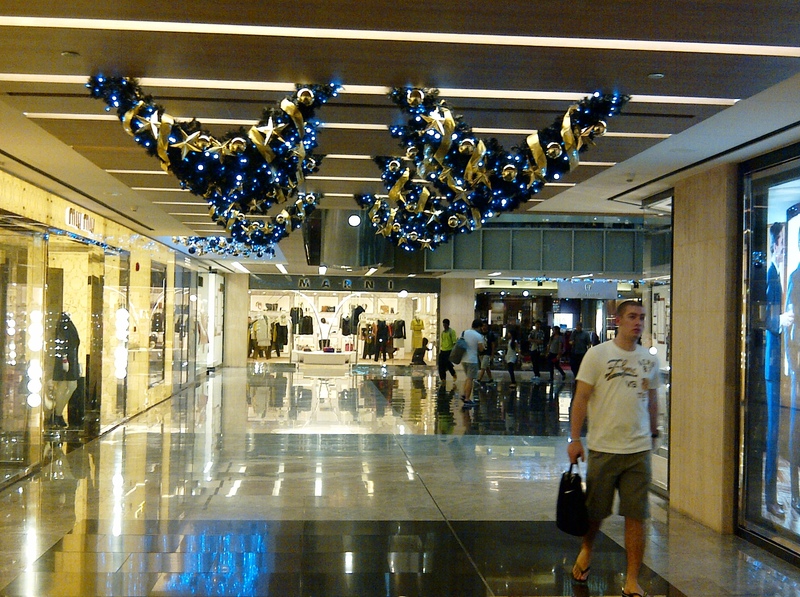 I love how Paragon went with this upside down Christmas Tree to be the focal point of their holiday decor. 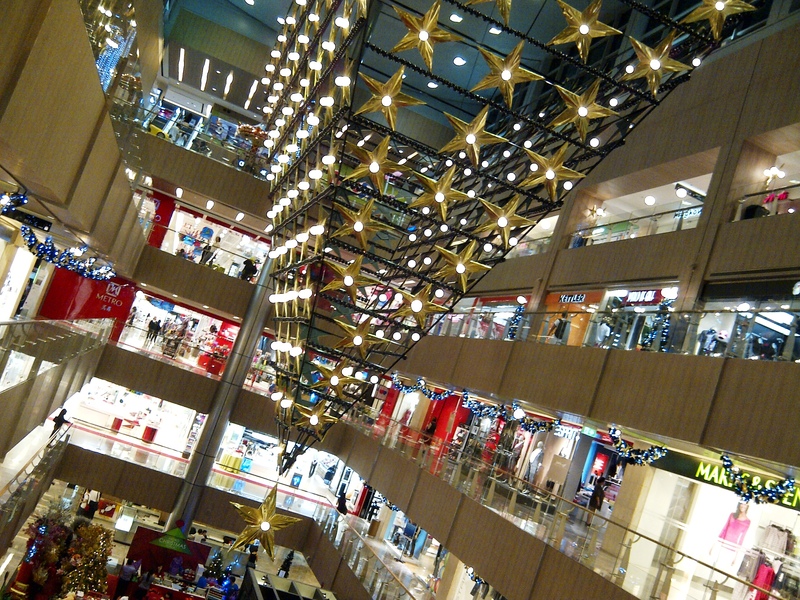 Paragon Mall on Orchard Road has dressed up for the season! Chicken Tau Kwa, Paragon Mall, Orchard Road, Singapore. This was The Boy Wonder's dinner. 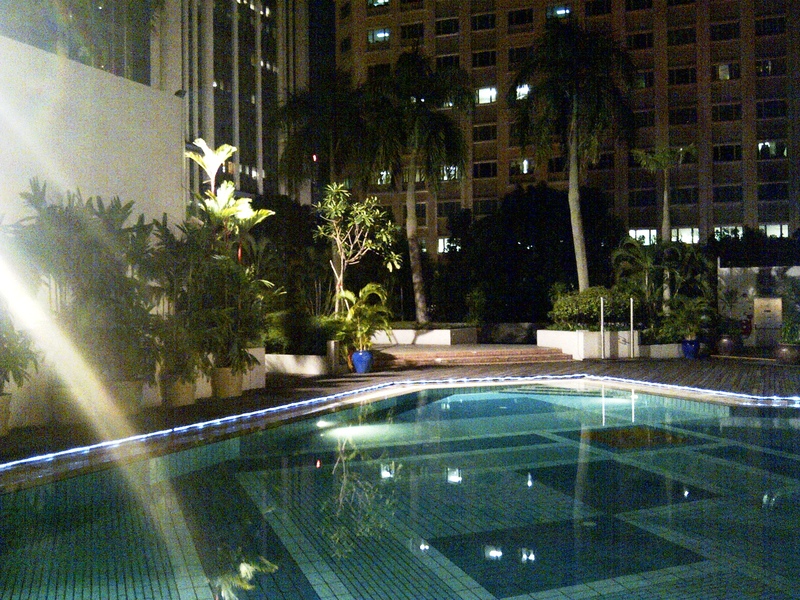 Great company makes a sumptuous dinner amazing. Here, with Partner. I THOUGHT I was successful in keeping to myself the interjections that were forming in my head when the bursting of the juices from the stalk of a soft annual herb in my mouth gave me away. Then the heat from the chilies in the dish started to reveal itself surreptitiously, creeping along the walls of my mouth before coating my tongue. It was a depth of flavors peeled in layers. I did like it. But if I was being honest at that moment, I should’ve said that I was on the verge of falling in love. All over again. Somewhere in the farthest recesses of my cerebellum convolutions, I have an indelible imprint of those ten days I got to spend in India – from Bangalore, to Goa, to Mumbai – taking in all the interesting culture, the rich history, and the undeniably amazing cuisine. The dish that snatched the compliment-disguised-as-interjection out of the tip of my tongue was the Chilli Fish, one of many dishes on offer on the restaurant’s dinner buffet. 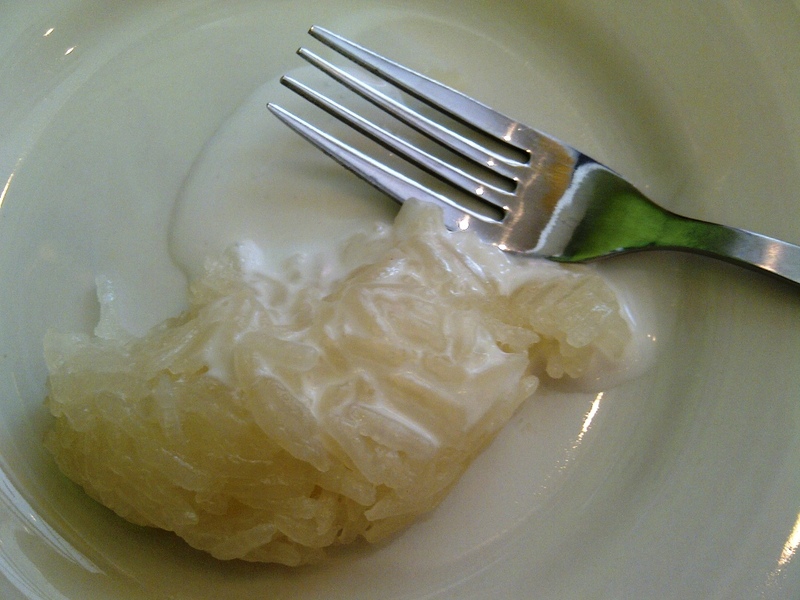 The fish was flaky, but not dried out, its delicate flesh ensconced in a light batter. The chili sauce, generously sprinkled with – yes, it’s that herb – chopped fresh coriander, elevates the dish from being what could be half of a fish & chips combo to something substantial and flavorful enough to have with rice. Saffron Rice to be more specific. I couldn’t help but moan as I mopped up the sauce with perfectly cooked grains of basmati rice, already fragrant on their own, but made more special with the hint and hue of saffron. The Mixed Vegetable Jalfrezi was a pleasant surprise. Visually appearing to be your usual vegetable stew, it packs a punch with a spiciness that sneaks up on you as you munch on green beans, peas and cauliflower. 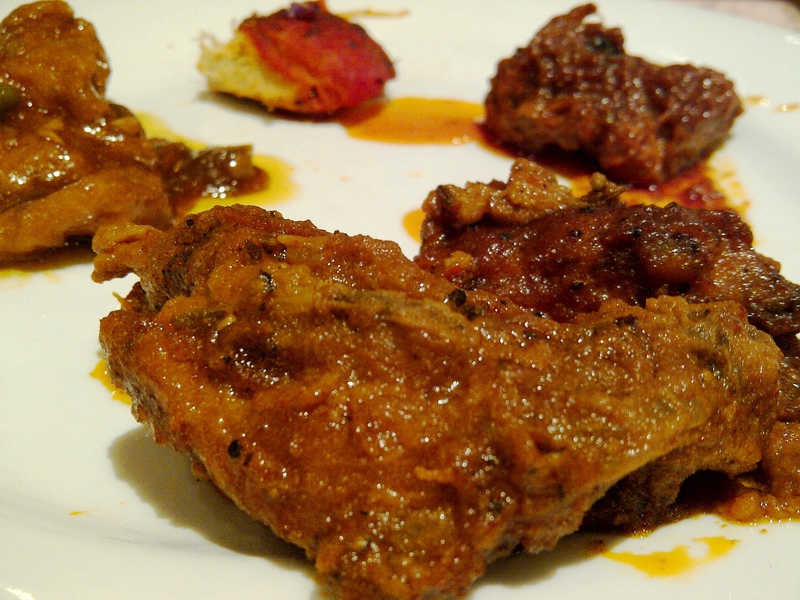 But apart from the spiciness, I got a lot of flavor from the vegetables themselves, which to me could be the result of frying them in oil and spices. A tandoor is a traditional cylindrical clay oven often used in Northern India. One of the parties I was able to go to along the shores of the Arabian Sea in Goa had a lot of these wood-fired ovens lined up, dishing out naan (Indian leavened flatbread) and tandoori chicken like crazy. I guess a place that attaches “Tandoor” to its name better be able to live up to both the history of this oven and the cooking technique steeped in tradition. 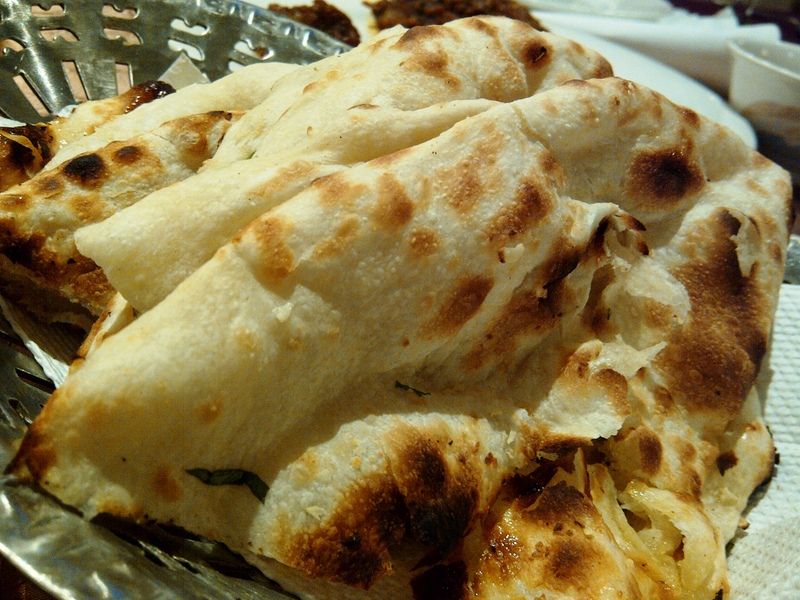 But the naan was the runaway hit. Warm, crusty and slightly burnt on the edges and the underside, it was still chewy, just how I love my bread to be. Drizzled with clarified butter, specked with herbs and minced garlic, I declare it as Asia’s answer to the usual garlic bread of French baguette slathered with melted butter and sprinkled with parsley. I excitedly texted some of my new friends at work – two of them (WCC and KS) were with me – just to tell them how much I enjoyed my meal. And the fact that I felt like I ended up eating “twice” most everything I got my hands on. A piece of the Chilli Fish. I kept on attempting to focus on the fish, but the Chicken Tandoori at the background just refused to be ignored! 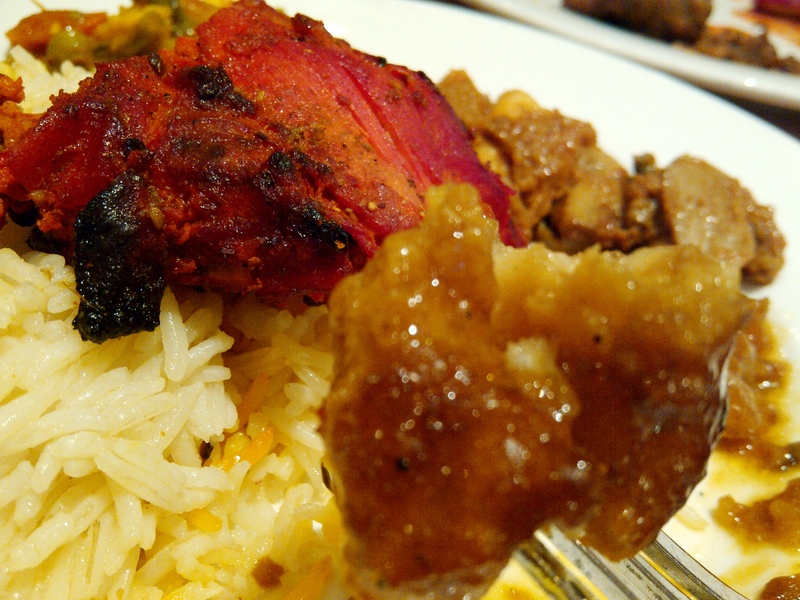 Chicken Tandoori perched on top of fragrant Saffron Rice. 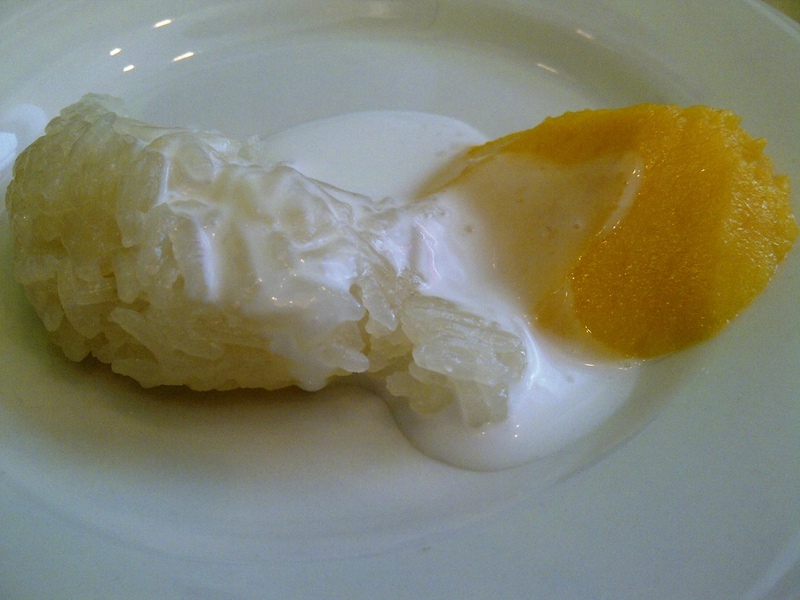 I don't know what this dessert is called. 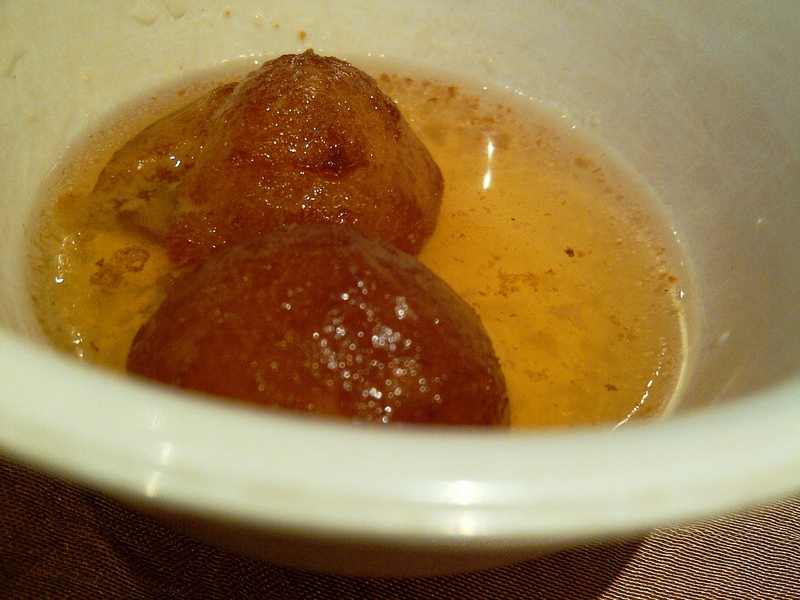 But they were like fried dough (KS said they were like cake balls) soaked in syrup or honey. 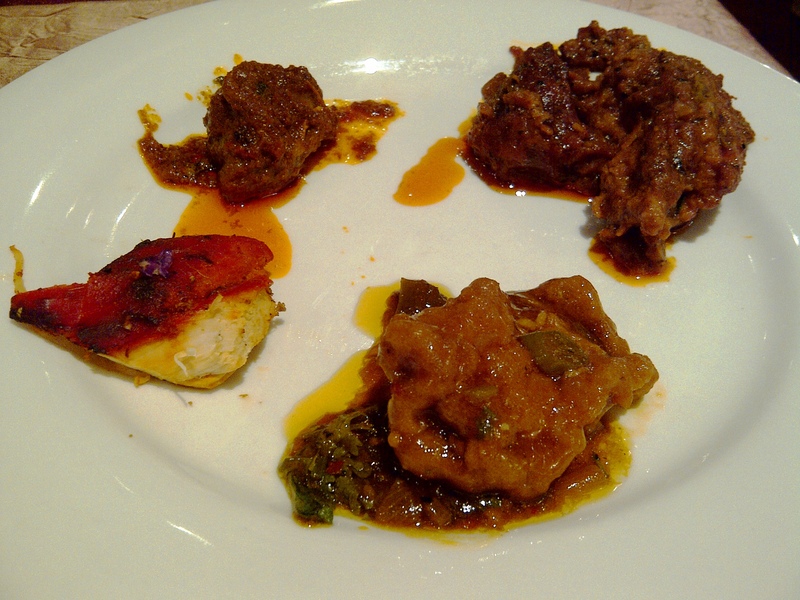 But I later realized that I didn’t even get to try the Mutton Rogan Josh, the Salads, and the Desserts. I think I just found my excuse to come back! 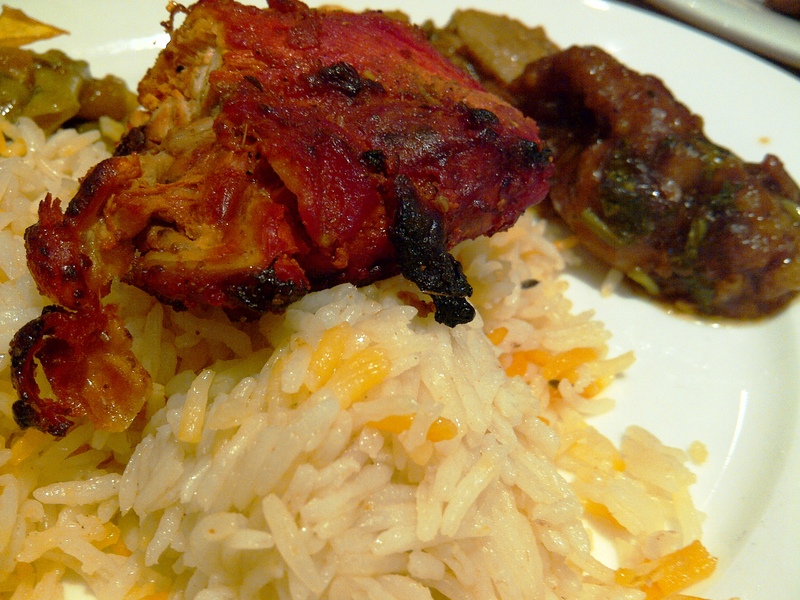 Indian cuisine is the love. Probably all you need to know about Riverwalk Tandoor. 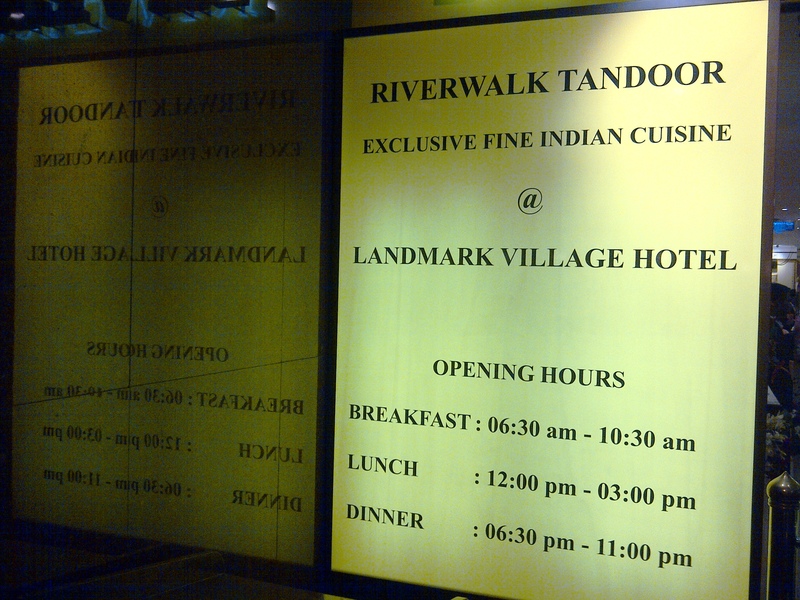 Riverwalk Tandoor is at the Landmark Village Hotel, Level 5 Poolside, 390 Victoria Street, Singapore 188061. 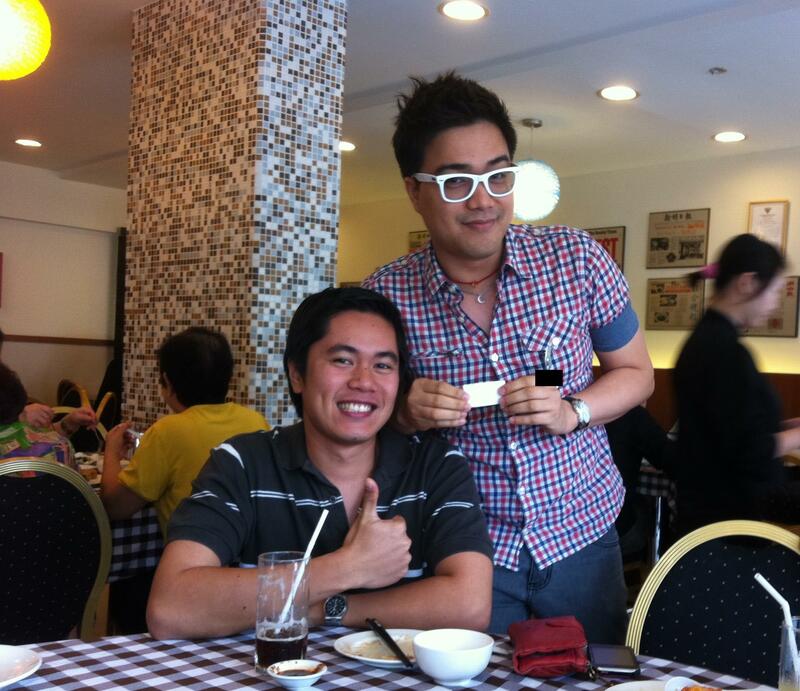 “DXPG,” MY good friend Darryl! 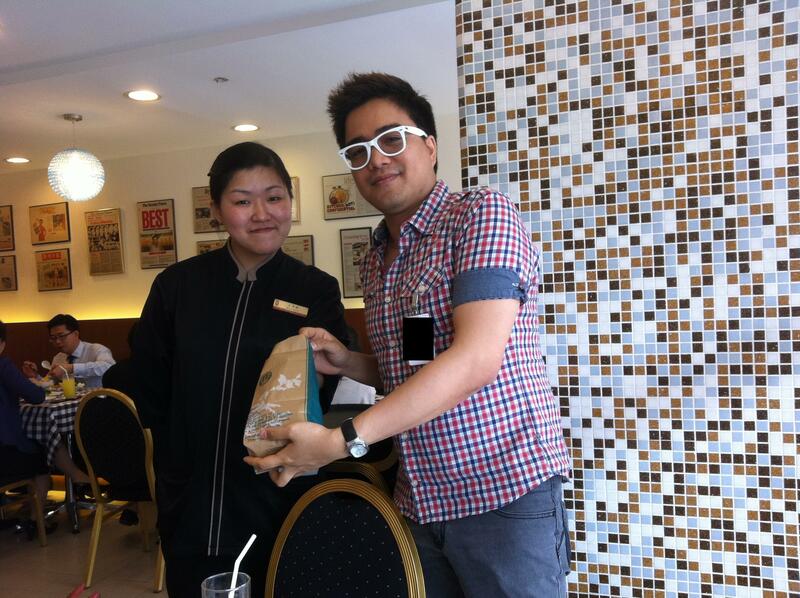 I decided to conduct the lucky draw over lunch of Hainanese chicken, chicken rice, steamed kailan with oyster sauce, breaded tofu, and prawn cakes at Boon Tong Kee last Tuesday, the 15th of November 2011. 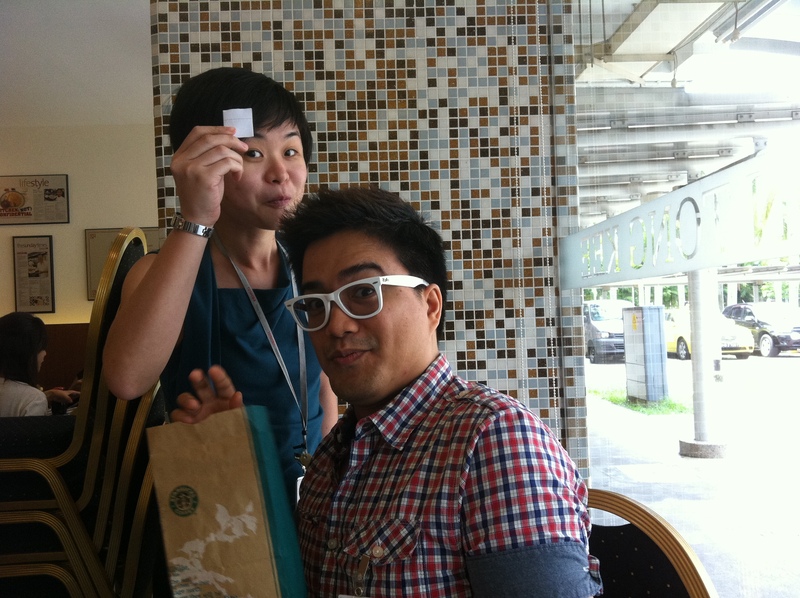 The honorary Filipina, Kwai Han, drew out the lucky name from a Starbucks® paper bag that had all the names written on identical sheets of paper. 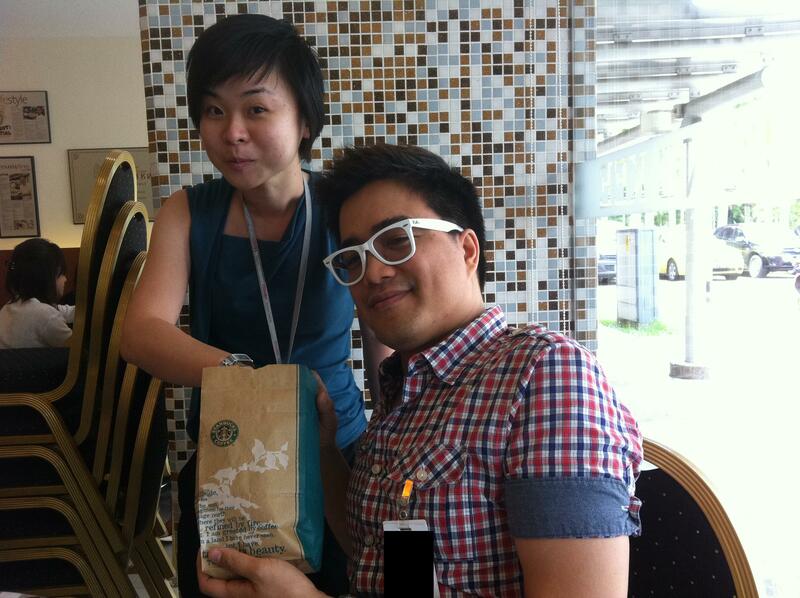 Kwai Han, the honorary Filipina, makes the "lucky draw"! 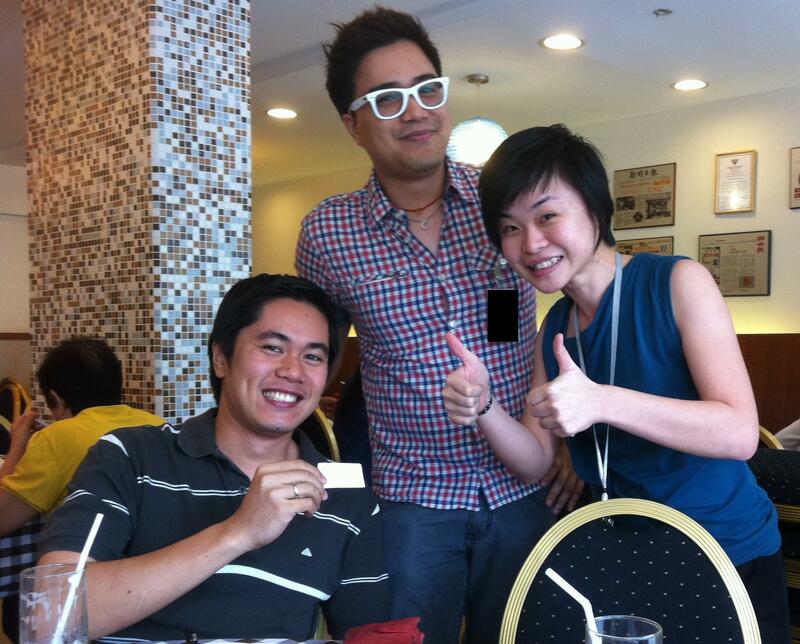 It's two thumbs up from Kwai Han! Overwhelmed by the response I got about what was simply waxing nostalgic about my blog turning three years old, I had the urge to make it twice the fun. 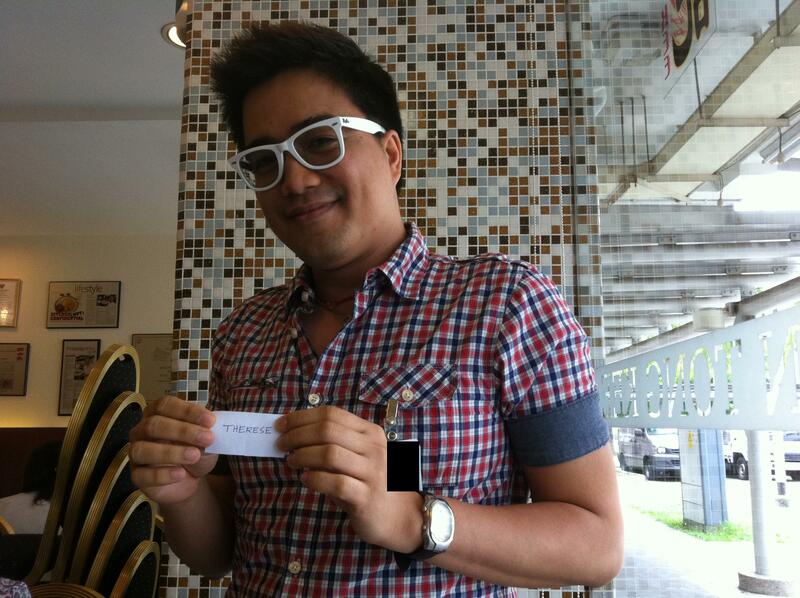 So here’s another winner, drawn by one of the lovely wait staff of the restaurant. 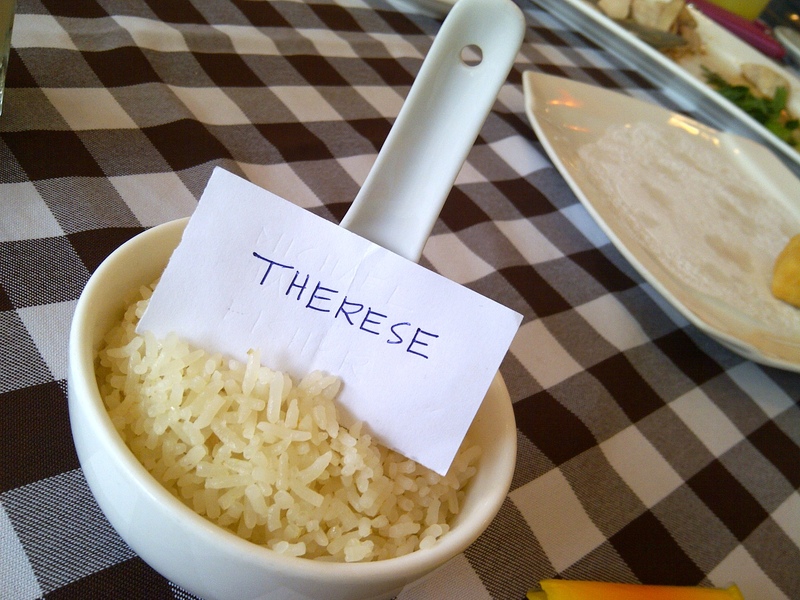 Therese and the chicken rice! 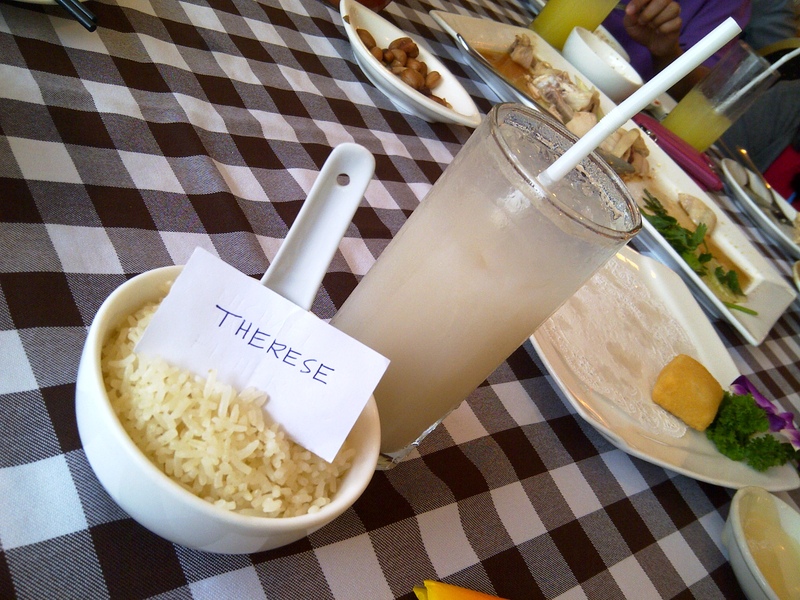 This time, Therese, chicken rice, and ice-cold barley. Again, thank you very much for the time you spend reading my thoughts. I appreciate it a lot. IF I ever wanted another person’s opinion, I would surely ask. I definitely know my way in and around a restaurant menu that I seldom ask for help. So if a wait staff would tell me to try something else after I had already placed an order, I would most likely express my disdain. Inaudibly. I would simply give my version of the deer-caught-in-the-headlights look. Something like that. And oh, chances are, I wouldn’t be coming back. At Formosa Delights, where I get my regular Tomato Noodle Soup, the people have probably been wondering how I have been able to totally dismiss the existence of their signature dish. The board put up in front of their stall and their literal hawking of their specialty had always been totally lost with me as I stood there anticipating only a dose of lycopene in a soup. Every single time. So when “darling” must’ve finally mustered enough courage to ask, and half-heartedly uttered, “Darling, will you try our dao xiao mian?… But tomato still,” her trepidation at my impending response came across as charming. The thought bubble above my head couldn’t help but compliment her smooth move. “Subtle,” the bubble actually spelled. And she did wait for us to get to know each other before she attempted to change my mind. 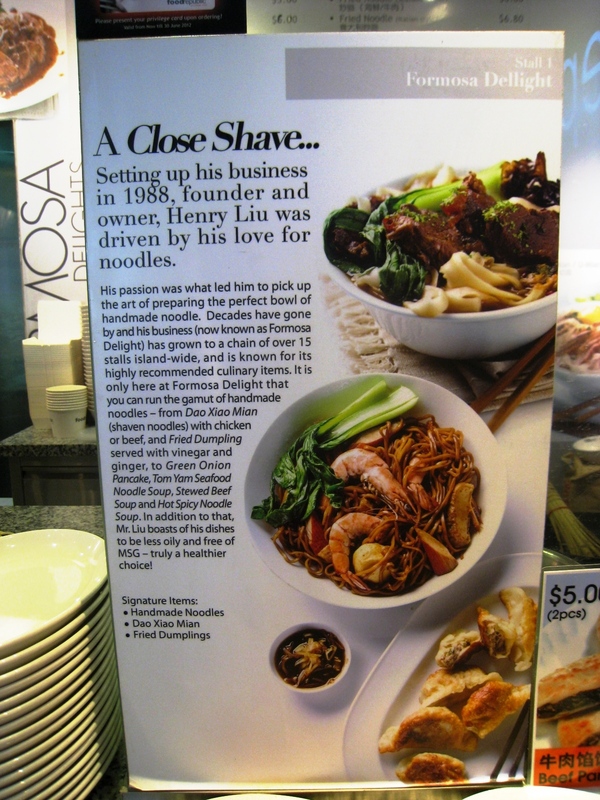 So I didn’t just take her up on her offer to replace my favorite u-mian noodles with dao xiao mian. 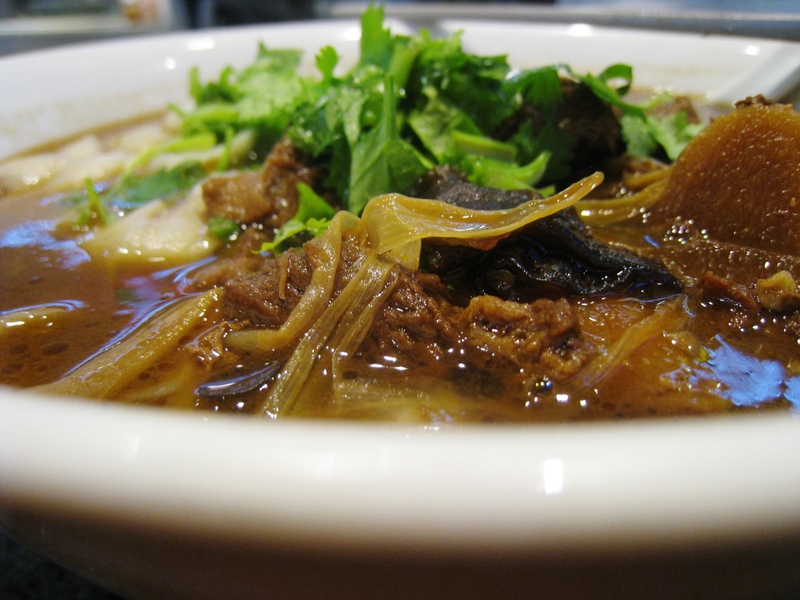 I took it a step further by totally doing away with anything tomato that night and asked for the works – dao xiao mian with beef. 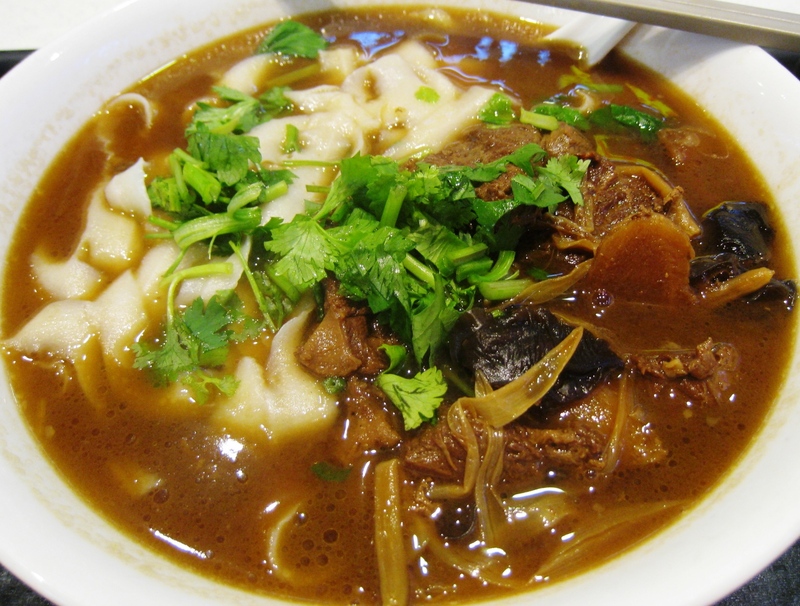 The huge bowl of dao xiao mian lovingly prepared for me. 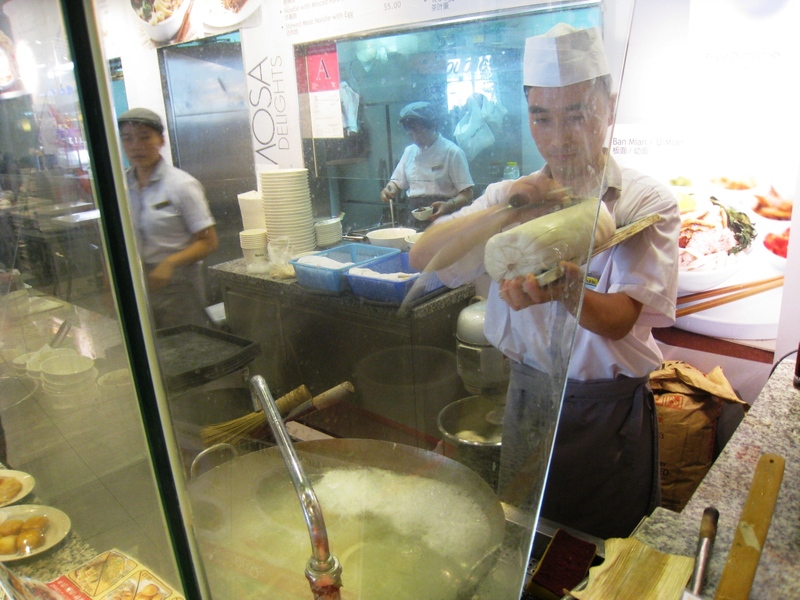 Dao xiao mian is noodles made by shaving thin strips of dough from a loaf, directly into a huge wok of boiling water. 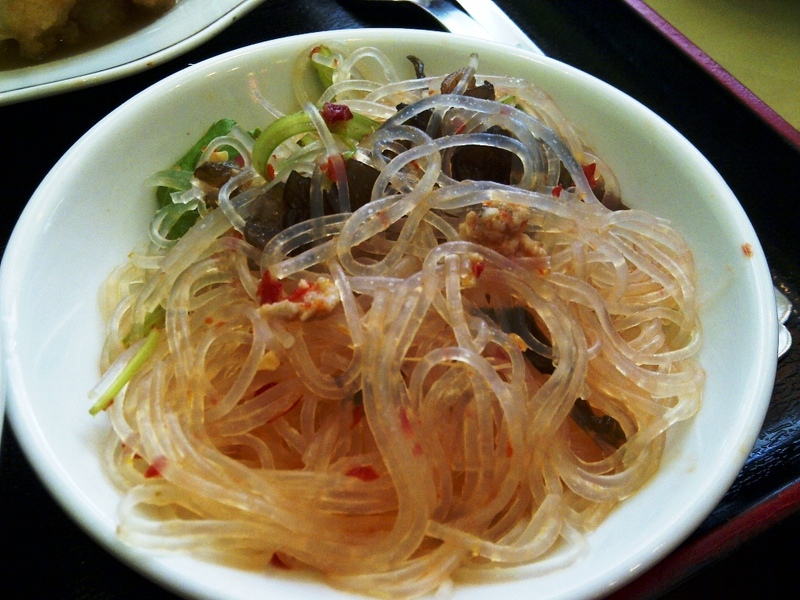 Quite artisanal and rustic, they’re the perfect example of handmade noodles. Everytime I would watch a bowl of this dish being made, I felt that I had gotten more than my five bucks’ worth – I would always get dinner and a show. The bowl that makes it to my table was huge. The steam rising from the surface carried with it the undeniable essence of star anise, struggling from beneath the initial arrest of the cilantro that had started to get infused into the soup the moment the bright green leaves hit the heat. 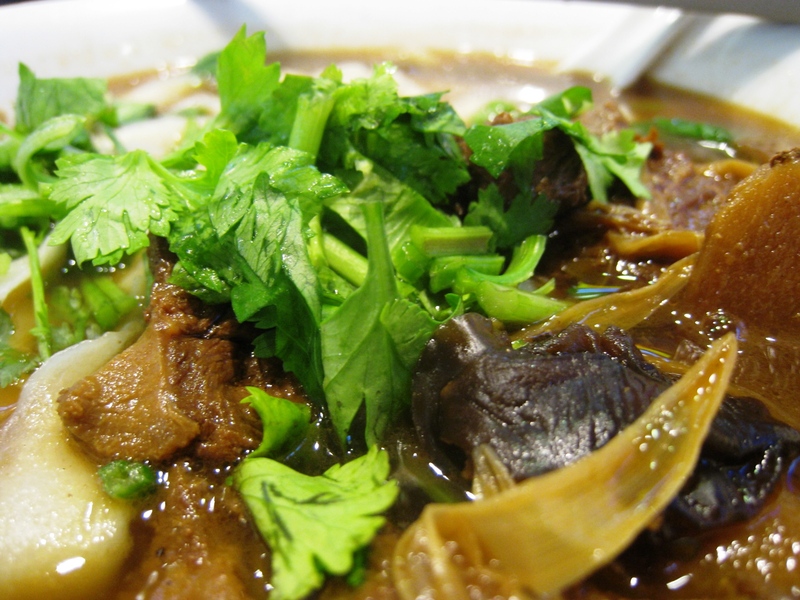 The broth was deep brown and in it, banana blossoms, slivers of ginger, and wood ear mushrooms were swimming. Visually, the concoction seemed so potent that I could surmise it was put together by some medicine man slaving over a ginormous earthenware. But no, it was put together by the very friendly cook, who, through the course of several visits, has become a real good friend too. 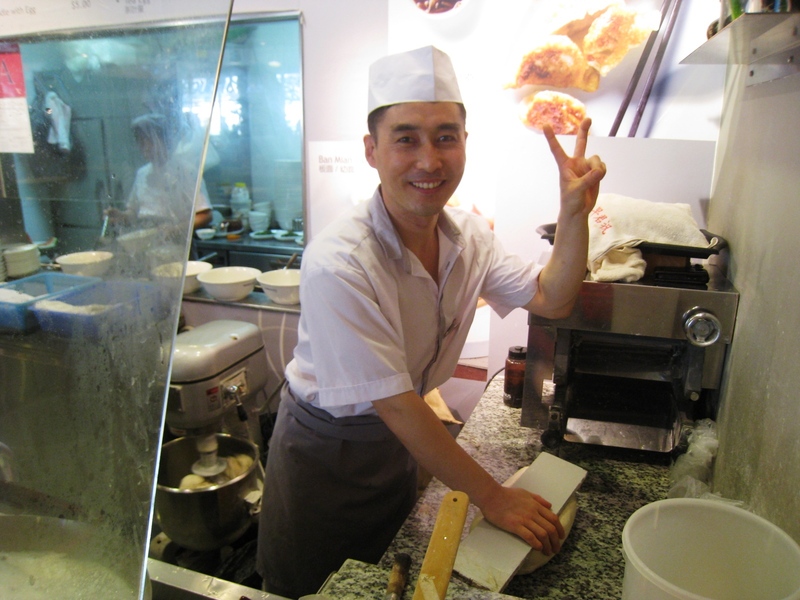 The cook is a master showman too! The beef that came with was fall-off-the-bone tender, which is ironic to say the least, as there weren’t any bones that made it to the dish. But if they fell off some on the way to my bowl, it was perfectly fine by me. 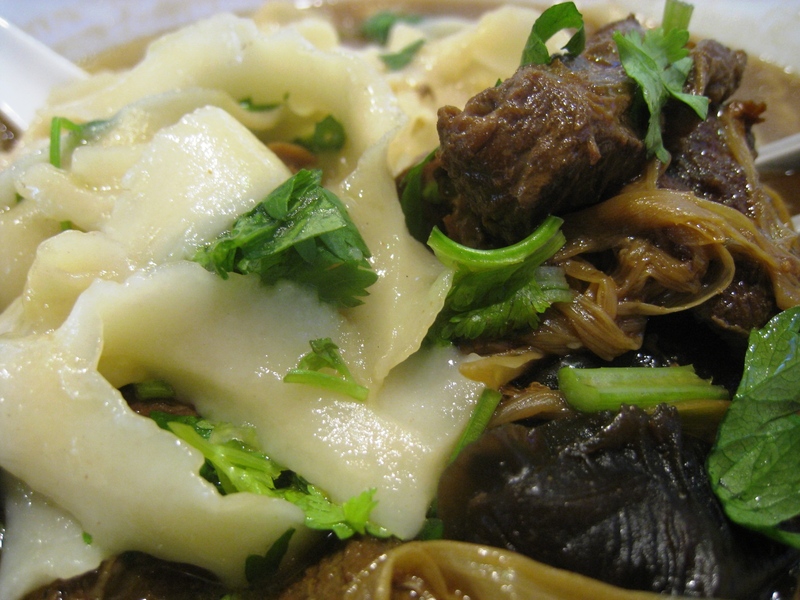 But the star of this steaming bowl of noodles is the noodles themselves – knife-shaved dao xiao mian. Perfectly cooked just the way I like it, a touch under, these noodles could make me feel loved, taken care of, and comforted. And staring at them, I couldn’t help but burst into a Stevie Wonder song. 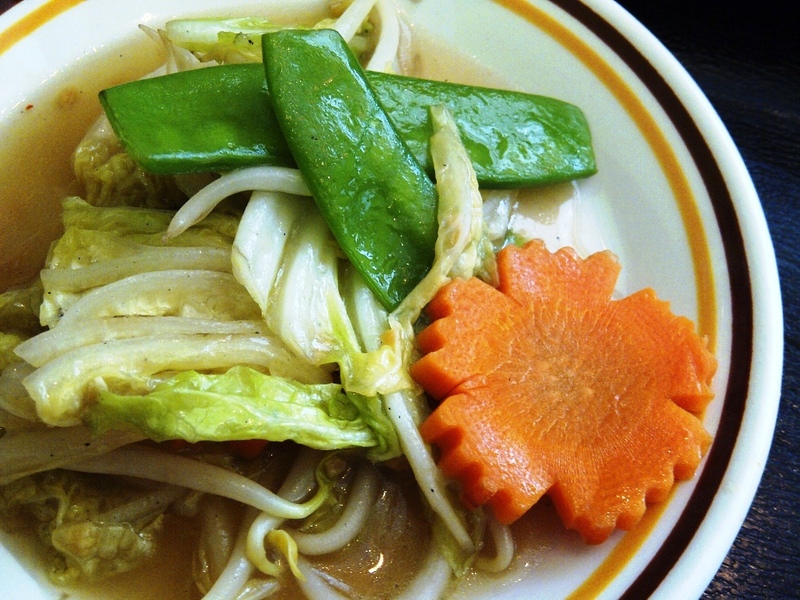 There’s a ribbon in the sky – in this case, in my bowl – for (our) love. I KNOW exactly the point when I’ve become friends with someone. I know it, when, upon bidding the cashier and cook at Formosa Delights a fond farewell right after devouring yet another bowl of their signature Tomato Noodle Soup (U-Mian), I had to tell them that they wouldn’t be seeing much of me for the next few days as I’m flying home for a few days’ respite. She didn’t actually have to declare that in my presence or within my earshot. I’ve known it all along. I knew it from the very first time she called me “Darling” when I showed up at the end of the line at their storefront. She can call me darling any time. Anybody who shares with me great food and heartwarming conversation can call me darling any time. 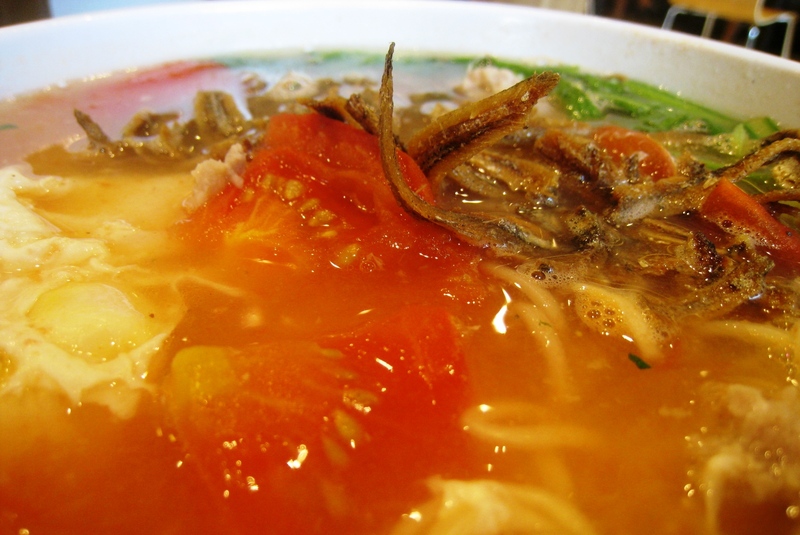 Quite obviously, a bowl of my favorite Tomato Noodle Soup by Formosa Delights. The question, in its simplicity and straightforwardness, managed to make me pause. And excitedly compose a reply. In between hitting the keys in staccato, I would close my eyes and imagine catching a whiff of lemongrass, kaffir lime leaves, and galangal. Undeniable flavors of the land of the free. I hit the send button and in minutes got a response. Apparently, my answer in the affirmative merited an enthusiastic recommendation from my correspondent, a new friend I made at work here in Singapore. 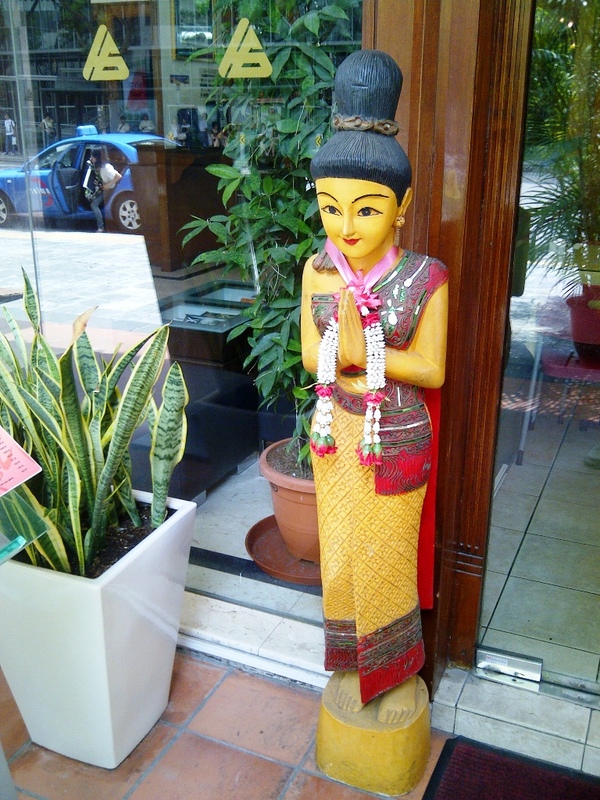 While striking up a conversation with one of the wait staff, I realized that D’Lemon Tree Thai Kitchen & Café has both. After all, I went there on a friend’s recommendation. And usually, before the restaurant’s 11:30 AM opening time, a line would have formed outside, patiently waiting for a taste of Thai. My friends and I went there for the lunch special. 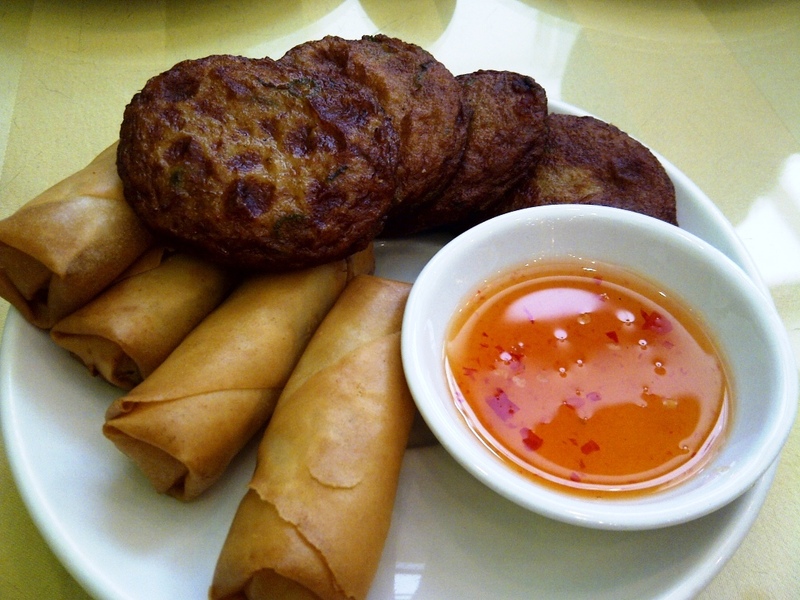 It consists of tom yam soup, a spring roll, a slice of fish cake, a choice of entrée, sticky rice and mango for dessert, and overflowing lime juice, coffee or tea. And oh, there were buffet tables where everyone had access to phad thai, and an array of desserts. 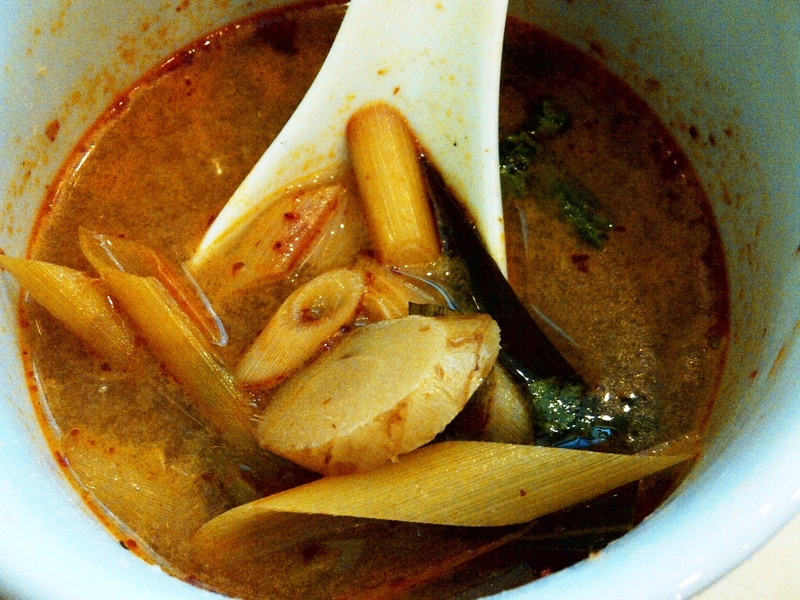 For those who opt to veer away from the really spicy, the restaurant offers an alternative to the traditional tom yam. For that day, they called it the Chef’s special, a clear soup chockful with chunks of vegetables. But I love tom yam and must’ve had it from Penang, all the way to Manila, to Bangkok (at the international airport), and now here in Singapore. 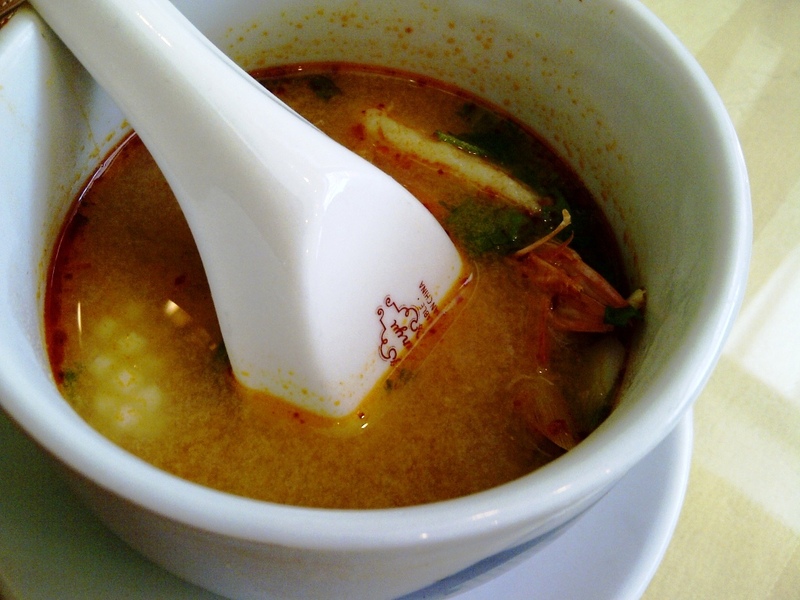 Tom yam is the traditional Thai hot and sour soup, flavored with bird’s eye chilies, lemongrass, galangal, kaffir lime leaves, and fresh lime juice. I was told that it originated from the southern part of the country where the shrimp is plentiful. 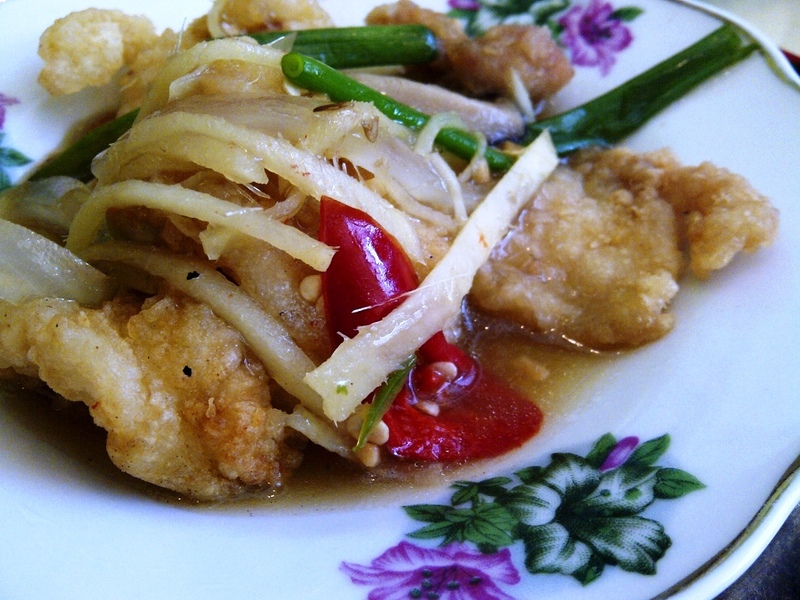 It was the Bangkokians who added roasted chilies in oil that had since given the dish its characteristic reddish color. I’ve had it with and without coconut milk, and do love both versions. 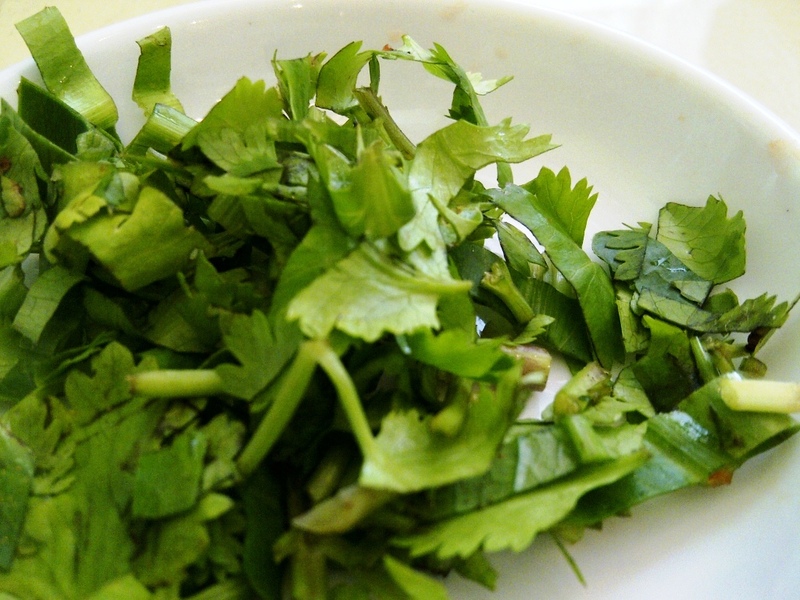 Fresh Coriander Leaves, coarsely chopped. 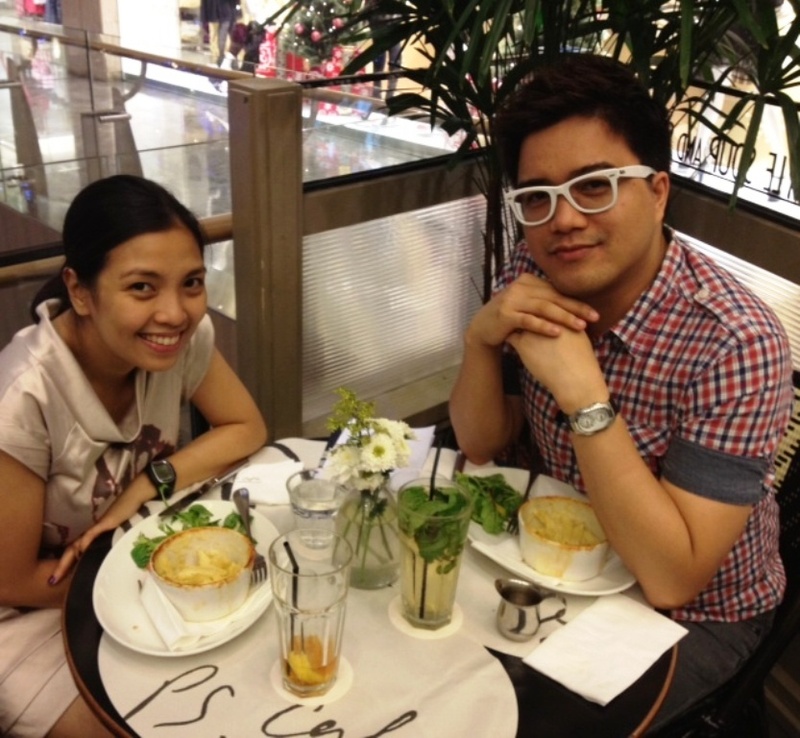 While my friends relished their desserts, I couldn’t be distracted from my second bowl of tom yam. In my mind, I thought that the soup was kind of authentic that I needed a passport to be enjoying it at the moment. Then I snapped out of it and knew that all it took to be savoring this value-for-money meal were my ez-link card, six short bus stops, and exactly SG$ 9.99 in change from my pocket. 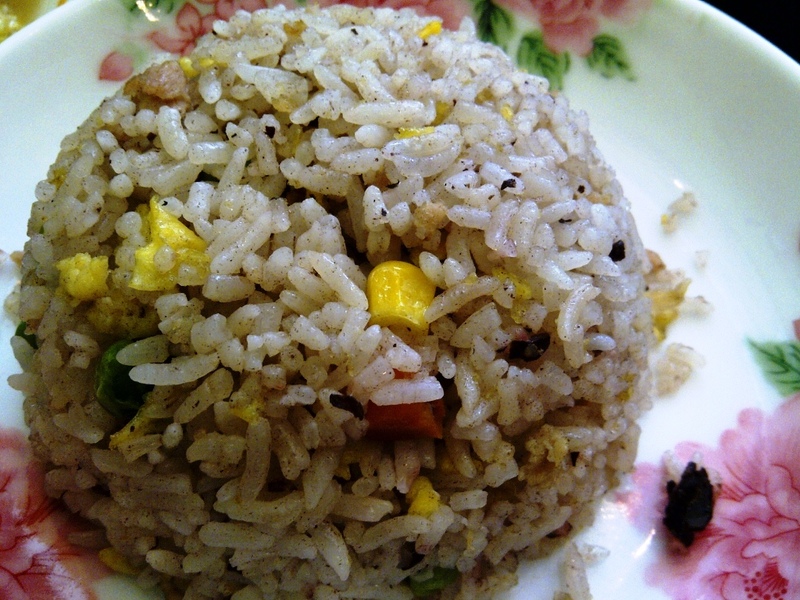 I love the sticky rice so much more than the mango. Here, I'm having seconds, courtesy of my friend. 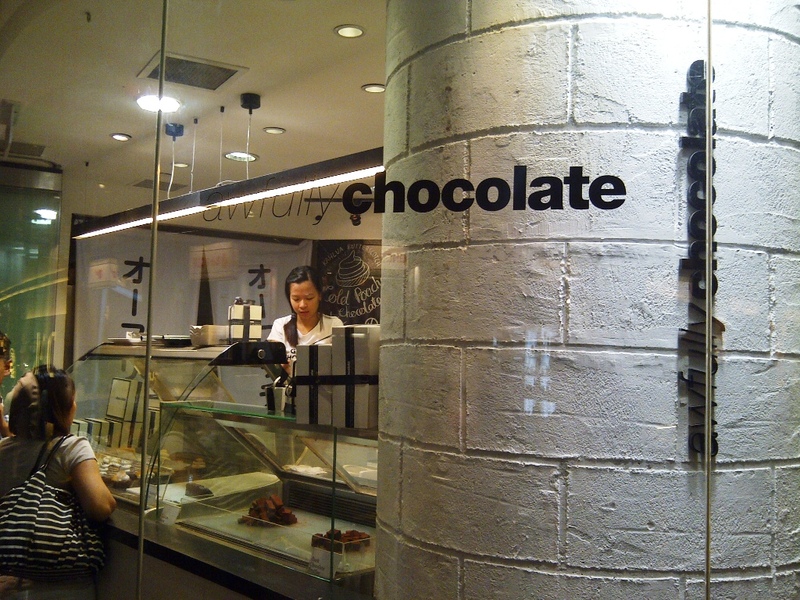 ON MY list of next must-try places is Awfully Chocolate at ION ORCHARD. They have an extensive handwritten menu on boards outside the store and on their wall that when I first read, made me feverish enough to convulse. 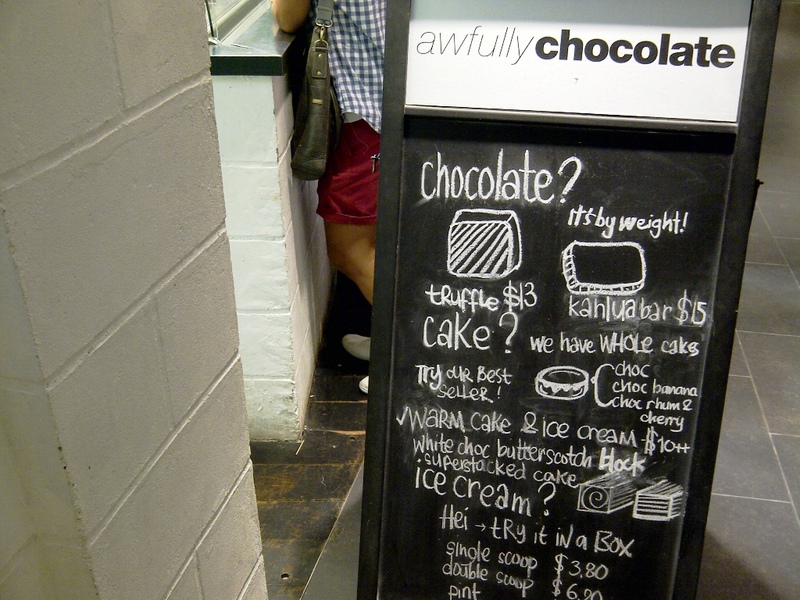 How could I not shiver upon reading a seeming culinary paradox as scrumptiously sounding as “cold poached chocolate”? That may be fancy, but it was the sight of the seriously chocolate cupcakes that pushed me over the edge. I got to go back. Soon! 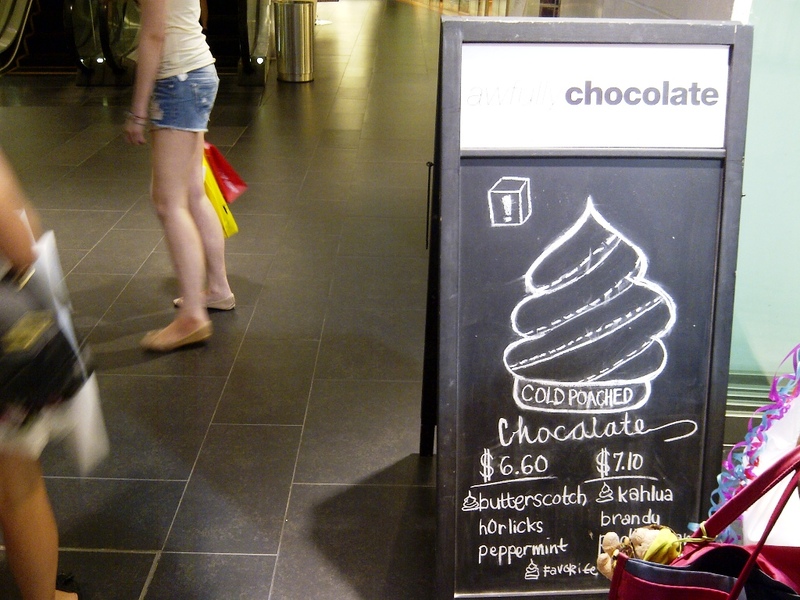 Care for cold poached chocolate, anyone? Truffle cake! Kahlua bar! And the best? It's "chocolate by weight"!